Improving the local environment in a growing city is challenging, especially in the current context of climate change, which is likely to cause increased intense rainfall events. These events may overwhelm under-provisioned drainage systems and cause toxic wastes to enter water bodies and rivers from informal dumping sites on their banks. In addition, the indiscriminate dumping of untreated solid waste throughout the cities can clog drainage systems. These problems are compounded by the rural-to-urban migration of job seekers, which has led to increased population growth and the expansion of cities into low-lying flood plains. 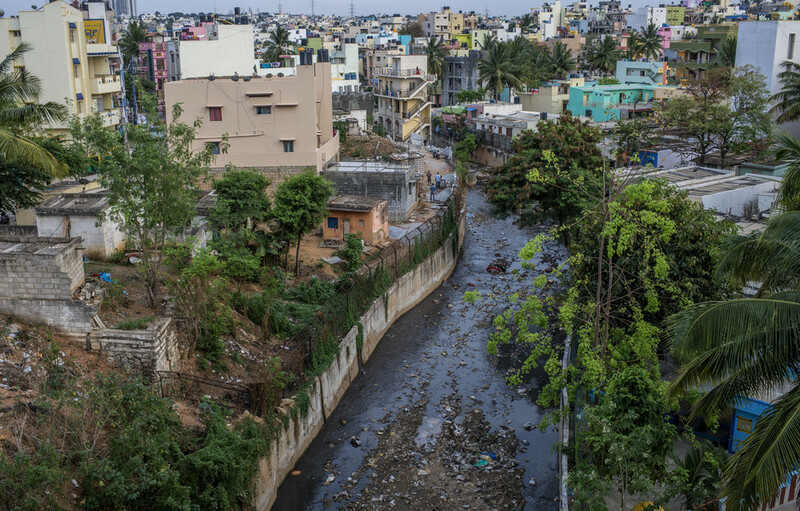 Waterlogging and water pollution mainly affect the poorest people who live in these areas or in less-developed sections of the cities. Consequently, municipal authorities are under pressure to develop strategies to manage flooding due to extreme climate events or lack of drainage infrastructure. The most common strategy is to invest in infrastructure so that cities can eliminate drainage congestion. However, an analysis of the causes of waterlogging in Bangladesh illustrates that investment in physical infrastructure is not going to be enough to achieve this goal. Cities need to work with their inhabitants to find a strategy to improve the current ‘urban culture’ of solid waste disposal. Such a solution calls for a change in human behaviour in terms of reduction and disposal of solid wastes. A research team from the South Asian Network for Development and Environmental Economics and the Asian Center for Development has been studying how to change human behaviour to improve solid waste management in two South Asian cities -- Sylhet in Bangladesh and Bharatpur in Nepal. The aim is to help avoid drainage congestion and resulting water logging due to indiscriminate dumping of solid wastes. Neither city has enough resources for managing solid wastes, relying instead on a fee-for-service system. For example, 94% of the residents in Bharatpur are paying a monthly fee to private firms to collect solid wastes. However, the residents have expressed dissatisfaction with the service, stating that waste pickup is irregular and incomplete – part of the waste is either not picked up or it is dumped in open spaces or down the city drains. The service providers complain that residents do not put their waste out on time at collection points or outside their homes, and the waste collector does not have the resources to return a second time to collect the waste. Meanwhile, municipalities have been spending significant amounts to manage solid wastes since the fees collected from the residents are not enough. The study team conducted several focus group discussions with the residents, service providers, and municipal officials. The stakeholders in Bharatpur suggested the use of street bins for shoppers and travelers. To test this idea, 75 randomly selected communities (out of 350 potential communities) were given the street bins. Households living in those communities were provided with information on how to manage their household wastes properly, including segregation at source, composting, reuse, and recycling. The study team trained committee members serving local communities on how to manage the solid waste better. For comparison purposes, another set of randomly selected 75 communities was identified as a control group. In Sylhet, the research team worked with the city council to initiate several green awards: one for city clubs who are responsible for daily disposal of garbage from households; another for households who segregate compostable wastes from other waste and keep their premises green; and a third for the garbage collectors who respond effectively to citizen feedback using a mobile app. The mobile app, which was developed as part of the research project, allows citizens to report unwanted garbage on the streets by sending a geotag-based photo to the city councillors. The research team is now documenting changes in human behaviour based on several of these interventions. In addition to examining the effectiveness of the interventions to improve the solid waste management and the waste mapping tool, other components of the research are assessing the preferences of residents regarding what services they want from the city and how much they are willing to pay in return. Another component involves drainage network modelling. The drainage network model helps to simulate different scenarios for identifying the flooding and water-logging potential in several parts of the city under different climate extremes and how city waste is managed. The preliminary findings of the research were shared with all stakeholders, which helped to develop a common understanding of the issues and the proposed solutions.